You ask a lot of questions about how I create my videos. What camera do you use? How do you mount it? What software do you use for editing? Maybe not you personally, but many of my followers, here on my blog, on Twitter or on YouTube, seem to want to know. That’s why I have this extra post now, to try to answer these questions. Not all of my now 455 videos were made with the same camera. Over the almost 6 years I have been filming now, I used 3 different cameras and one smart phone. I did stay loyal to one particular brand of cameras, because I got attached to the ease of use and the good quality of the videos, that also improved with every new camera. 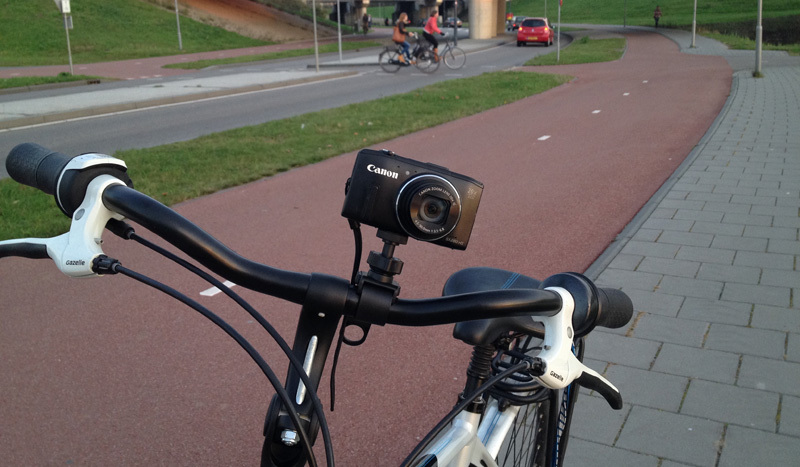 The four cameras I have used to create my videos about cycling in The Netherlands. 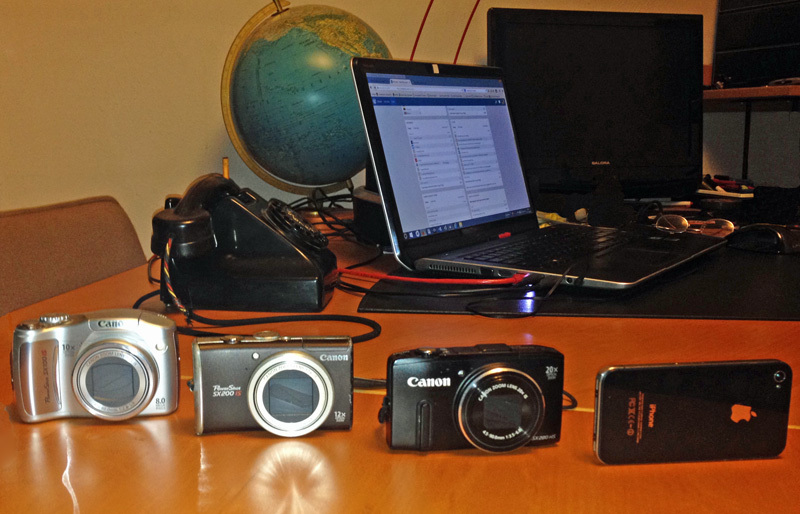 Left to right Canon Powershot type SX100, SX200 and SX280 and my iPhone 4s. Mid-2008 I bought a new camera to replace an earlier photo camera. That new Canon Powershot SX100 turned out to be a great camera to film, so I started to do that more and more, especially on holidays. One example is the Cattle Auction video of Charters Towers in Queensland, Australia in May 2008. When I read some strange comments on the internet about how dangerous Dutch cycle tracks supposedly were, I decided to use this camera to make my first video to explain what cycling in the Netherlands really was about, in January 2009. Because the developments of cameras went fast in those days, I replaced that camera in January of 2010. I had liked the Powershot SX100 so much, that I chose the Powershot SX200, its successor. That newer camera filmed in wide-screen and the quality of the images improved a lot. With that camera I filmed the now legendary Utrecht Morning Rush Hour video. The camera was small, so people on the streets had no idea I was filming and not taking pictures. Which is great, because I want to have people behaving normally in my videos. The only disadvantage of that camera was that it didn’t have an image stabilizer. I tried the YouTube option to stabilize the images and that worked to an extent but all the really tall objects like trees, street lights and bridge pylons start to move as if they are of rubber. You can see this really well in the Nescio bridge video. But then I got a newer version of Windows that didn’t have “Movie Maker” anymore that I had always used for editing. Instead, I started using Adobe Premiere that did have a good video stabilizing feature, and that was the end of the dancing pylons. This guy is cycling in Davis California. Left of this foot you can see a piece of dirt that crept into the lens of my camera somewhere in a desert in Arizona. I was very sad when on our holidays to the US in 2013, dirt crept into the lens, somewhere in the Arizonan desert. The video portrait of the US shows the Chicago images without, and the San Francisco images with a piece of dirt on the video. Someone on YouTube commented: “The smear on the camera is bothering me.” Well yes, it was really bothering me too! I tried to get it away and in the end it was brought back to two dots, clearly visible in the video of a ride in ʼs-Hertogenbosch. That video made me decide to get a replacement camera. Also because I had read on the internet, that more people had this problem and that it could only be remedied by replacing the lens, which cost almost as much as a new camera. I had really grown accustomed to my Powershot, so once again I bought the follow-up design, hoping it would be as good as the previous type. That was certainly true. Much more than that. The new Powershot SX280 films in full HD and records sound in stereo! And it has a great built-in stabilizer. The only downside is that it is a bit harder to hold while cycling, but I have now found a way to hold it, that I can keep up for up to 20 minutes while one finger covers the two microphones. That way I try to keep the sounds of the winds to a minimum. I tried the camera out in this video. And I am using it to this day. Sometimes I find a good subject to film without having that camera on me. In that case I may decide to return, but I have also used my smart-phone to film. There is one video that was entirely filmed on my iPhone 4s. But that is an exception. In April 2013 my computer crashed. I had to replace it, including my editing software. From then on I have edited the videos with Adobe Premiere Elements 11. The first video I edited in the new program was the video about a visit to a bicycle shop. I couldn’t have picked a more difficult one! I needed texts as subtitles and I needed to have the sound of the interview continuing over other images. Forced by necessity I found all the editing features I needed within one week! So that leaves me with the most asked question. How do you mount your camera to your bike? Some even have the audacity to ask whether I attach the camera to my helmet. To my what? I never have, nor will I ever be wearing such a thing. I didn’t even in Australia! As you can see I have a great device to mount the camera to my handlebars. But I never use it. But no, I don’t mount my camera. I always film with the camera in my hand. And I can show you why. I do have a tool to mount the video to my handle bars. When I found out my current camera has good image stabilizers I decided to try if it would be a good idea to start mounting the camera. So I tried the same cycle track with the camera mounted and again with the camera hand-held. I think the images speak for themselves. The hand-held images are much more stable. Because with my arm I counter most of the movements. When the camera is attached to the handle-bars you see every little bump in the surface. I also tried stabilizing the images with my editing software, but that is at the expense of the image quality and that is also not a good solution. So I will continue to film hand-held! I hope this answers the questions some of you had. I was considering finding a way to mount my new Canon EOS Rebel T5 to my bicycle. Seeing how your post indicated how bumpy it was with the compact PowerShot, I think it’s safe to say do not attempt to mount SLR cameras to bicycles. Maybe you have some suggestions for doing SLR photo/video while riding? Nice Gazelle bicycle. How about an update video for your bicycles, maybe how one actually gets a bike like that from the apartment block bicycle storage area to the roadway, maybe seeing if you can find a friend who doesn’t mind having their shed filmed. Have you considered strapping a camera to a hat, like the regular ones like baseball caps, and wear the hat? Or putting a spring on the mount so that the spring absorbs the movement in the same way heads and necks balance helmetcams and your arm counters movement on your videos? Thanks Mark for this post, as it answers my question from a few weeks ago. Hand held certainly works very well on cycle paths and flat ground. Would be nervous doing the same while riding in traffic and down hills. Something we deal with daily here in Canada. I, too, am thankful to you for making and sharing these inspiring videos. They will help a lot to change the public mindset here in Japan. Try covering the microphone holes with thin masking tape. It drastically reduces wind noise. Now we can see some of the reasons why your videos are much better than what most other people shoot while riding a bicycle. I often wondered how you got the kind of results that you do. 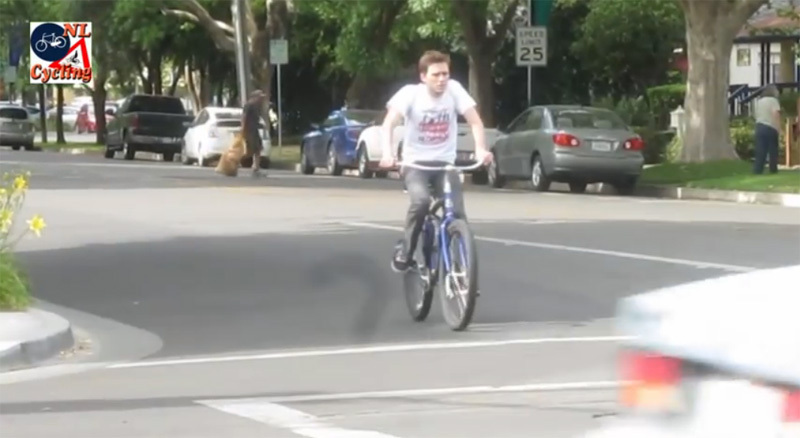 Here’s an example of shooting a video riding with the Dutch delegation from the airport for the Los Angeles Thinkbike workshop in 2011 with cameras mounted on a bike helmet and on a strap worn on the head. Aaron Kuehn is the one talking with the helmet mounted camera and Dutch representative Richard ter Avest is riding next to him with the strap mounted camera. They are riding along the Los Angeles Balona Creek bike path heading away from the ocean. Towards the middle of the video Richard tells Cor Van Der Klaauw (another Dutch representative) what they are doing. Directly in front of them towards the end of the video is Cor and Michelle Mowery who is the planner with the bikeways division of the Los Angeles Department of Transportation. The black blotches on the bike path is paint applied over graffiti markings and the steep concrete walls that are next to the creek are for flood control when it rains hard in the winter. Notice how the two Dutch delegates are not wearing bike helmets. The Dutch were offered helmets at the start of the ride but refused. When the group started riding in the streets with motor vehicles some of the Dutch decided that the danger of getting hit by motor vehicles was enough that they decided to wear bike helmets at that point in the ride. Here’s the slide presentation given by Hillie Talens at the LA Thinkbike workshop with pictures of Cor and Richard. What’s happened for bicycle infrastructure in Los Angeles since then is that there has been about ten miles of bike paths and 220 miles of bike lanes installed. The percent of commuters who use a bicycle as their primary means of travel to work increased by 20% (now at 1.2%) for the 2013 results. The percentage of increase in bicycle commuters has outpaced the increase in transit commuters from 2005 to 2013. There were 4,200 more bicycle commuters in 2013 (greater increase than transit) and a 42% increase in bicycle boarding’s at transit rail stations. Thank you. This is kind of nerdy stuff but people are interested. Your recent videos are much higher quality than the earlier ones. It’s noticeable. I have also tried shooting clamping the camera to the handlebars or front fender and with handheld. Handheld is better for me too. I have also had success with a small monopod handheld. This way you can get shots of the wheels and pedals going around. You shoot upside down and then rotate it in the editing. You can also raise it up high for a high shot. My camera is an actual video camera. A Sony with optical image stabilization which works very well. The entire lens and chip assembly is in a gimbal mount. It’s much better to stabilize when shooting than to do it in post. And since most cameras use CMOS chips, they have what’s called a “rolling shutter”. Each row of pixels is recorded at a slightly different point in time within each frame. This is what gives the “jello-cam” look you see when there is fast camera movement. To avoid it you either need to stabilize when shooting, or spend a few more thousand for a higher end camera that has a “global shutter”. I and many others thank you for making these videos. Often everyday life doesn’t get recorded and so the historical record becomes mostly of the unusual. In the future we have an inaccurate view of life. Ha, I have the same mount for my camera. Only difference is that my bike has a front suspension, so I have a lot less shaking than you have. This entry was posted on 24 November 2014 by Bicycle Dutch in Original posts and tagged small things.